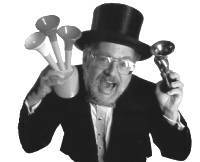 The Online Internet Site for Information on Dr. Demento music, songs, lyrics and chat. The Dr. Demento Show is radio's weekly two-hour festival of "mad music and crazy comedy" heard on stations coast to coast. It is a free-wheeling, unpredictable mix of music and comedy. Along with legends like Spike Jones, Tom Lehrer, Stan Freberg, Monty Python, and Frank Zappa, the Doctor plays new funny songs sent in by amateur and professional singers and comedians. That's how the world was introduced to "Weird Al" Yankovic, who went on to become rock music's best-known funny person. A home-made tape that Al made at age 16 and sent to the Doctor provided him with his very first media exposure. Those who've listened carefully to the Doctor's show have undoubtedly realized that somewhere between his lively larynx and elegant top hat there resides the mind of a seasoned musicologist and dedicated scholar...a world-renowned record collector and music historian, whose lifelong passion for music of all kinds is reflected in his weekly selection of "rare records and outrageous tapes" for the Dr. Demento Show. 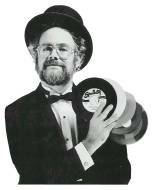 Dr. Demento was born Barret Hansen in Minneapolis in 1941. His father was a talented amateur pianist, and Barret began taking piano lessons at age 6, but the family phonograph always interested him more. When he found, at age 12, that a local thrift shop had thousands of old 78 rpm discs for sale at 5¢ each, the Demento Archives were on their way. Though Spike Jones was an early special favorite, the Doctor-to-be wasn't always a comedy specialist. As rock & roll swept America in the 1950s, he developed a special fondness for the music's roots in R&B and country. Over the years he's done quite a bit of writing in that area, including numerous magazine articles, liner notes and two chapters on early R&B for The Rolling Stone Illustrated History of Rock & Roll. His first DJ work was at his high school's "sock hops" in 1957. At Reed College in Portland, Oregon he became student manager of the campus FM station before graduating as a (classical) music major. At UCLA he indulged his passion for the roots of rock by writing a master's thesis on the evolution of R&B in the 1940s and early 1950s, while making his L.A. radio debut with a program of pre-WWII blues and country on non-commercial station KPFK-FM. 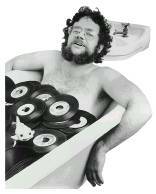 After getting a taste of the contemporary rock & roll life with brief stints as a roadie for two popular L. A. rock groups, Canned Heat and Spirit (and producing a demo for the latter), he went to work for Specialty Records, compiling some 35 reissue albums for that legendary R&B label and also producing new recordings. It was while he was working for Specialty that L. A. 's legendary free-form rock radio station KPPC-FM asked him to do a weekly program of rock rarities. It was there, in 1970, that Barret Hansen became Dr. Demento, as listeners demanded more and more of such zany blasts from the past as "The Purple People Eater," "Transfusion" and "The Monster Mash." The Dr. Demento Show moved to KMET-FM in 1972 and soon became the most listened-to Sunday evening radio program in Los Angeles. His spectacular ratings were soon duplicated in many other cities as the show went into syndication in 1974. The show is currently distributed by Talonian Productions. The first Dr. Demento compilation LP was released in 1976 by Warner Bros. followed by a dozen more, primarily for Rhino which has also released a Dr. Demento home video. In addition, the Doctor's fan club, The Demento Society, has produced three CD's available exclusively to Society members. In 1991 an hour-long Dr. Demento Anniversary Special was shown by cable's Comedy Central, featuring live performances by "Weird Al" Yankovic, Bobby (Boris) Pickett ("Monster Mash,") Sheb Wooley ("The Purple People Eater,") Tiny Tim and many others. The Doctor's numerous TV credits also include two April Fool's specials for MTV, and voices for 1994 episodes of The Simpsons and Bobby's World. In 1988, Dr. Demento provided off-screen narration for a feature film, the horror movie spoof Lobster Man from Mars. When not on the air, the Doctor also keeps busy doing research projects (many for Rhino Records), making personal appearances, and keeping up the Archives. Among those who've commissioned him to provide rarities from the collection are Rhino Records, Time-Life Records, MCA Records and Columbia Records, plus Aerosmith, Randy Newman, Bette Midler, Ry Cooder and David Lindley. The Doctor resides near Los Angeles with his wife Sue. For a list of Dr. Demento's credits - Click Here! National Radio Hall Of Famer Dr. Demento celebrated his 40th Anniversary in 2010! Click to hear the two and a half hour celebration! MEET THE DR IN PERSON - If you would like Dr. Demento to appear at your next event Click Here. Webmasters click here if you would like to link to DrDemento.com. © 2019 DrDemento.com. All rights reserved.